The current BBC mini-series ‘The Night Manager’ – based on the book by John le Carré – is revealing a side of Mallorca that’s different to the Spanish island’s more usual portrayal in the British tabloid press. The scenes of Mallorca in the second episode must have been a revelation to those whose perception of the island has been coloured by images of ‘over-refreshed’ and possibly over-sexed holidaymakers, seen in some newspaper reports and voyeuristic reality TV programmes. Actor Hugh Laurie – who plays Richard Roper – must have seen a great deal of Mallorca during his stay. Not only was he travelling around the various island locations, he also stayed at the 5-star Castillo Hotel Son Vida for the duration of the shooting. Located on the Son Vida hill, a short drive from the heart of Palma, the elevated position of this historical hotel (a renovated 13th-century castle) would have given Hugh panoramic views of Palma and the Bay of Palma. Lucky Hugh. ‘The Night Manager’ features the spectacular British-owned 17th-century La Fortaleza estate at Puerto Pollensa – playing the island home of bad-boy arms dealer Roper. The fortress was originally built to defend the peninsula on which it sits. The estate covers 232 acres, and has more than 15,000 sq ft of terraces and nearly 12,000 sq ft of gardens. 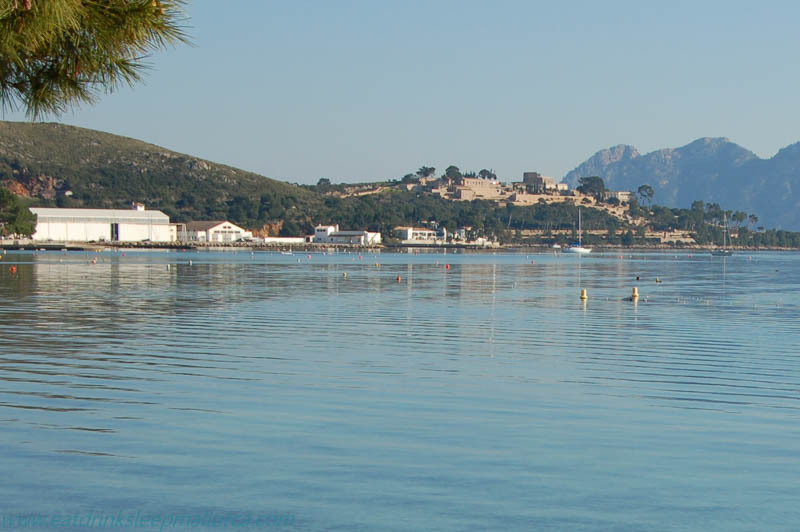 La Fortaleza in the distance from Puerto Pollensa’s Pine Walk. Argentinian artist Roberto Raumagé bought the property in 1919 and renovated the ruined buildings. The estate was sold by his family to a British owner in the late ’80s. Another British buyer became the owner of La Fortaleza in 2011, for a sum reported to be between 30 and 35 million euros. The estate had originally been put on the market by the real estate agent for 100 million euros. The not-easily-reached waterfront restaurant Ca’s Patro March in Cala Deià was the location for the fake attempted kidnap of young Master Roper. Both places are breathtakingly beautiful and I know I’m not the only writer whose blog has come up in searches for ‘Mallorca locations + The Night Manager’! In the fourth episode, when Angela had a meeting in a restaurant in Madrid, the location was the Palma restaurant Sa Drassana. It’s located in the area known as La Lonja, in a square packed with bars and eateries (and close to the President’s office). In the 4th episode, Roper et al checked into a hotel in Istanbul. 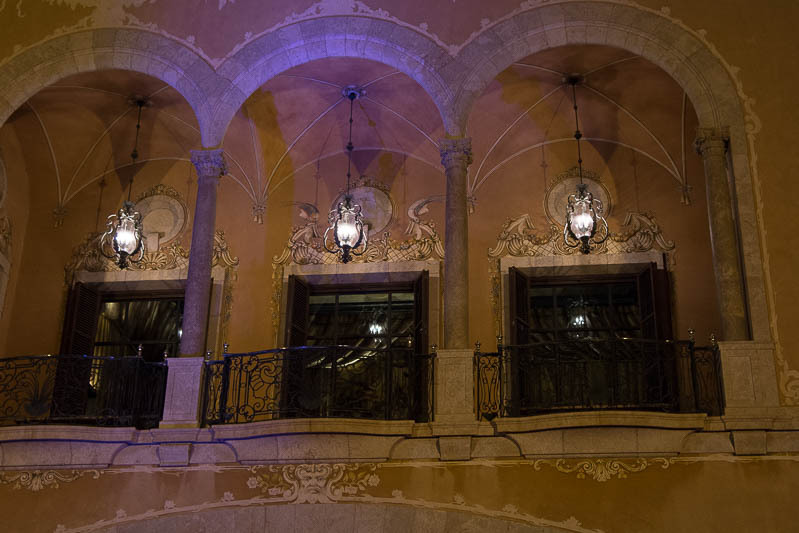 The exterior of the hotel – seen briefly as the party arrived – was actually the beautiful Palau March in the centre of Palma (close to the Cathedral). It’s a museum – with some notable sculptures – and the home of the March Foundation. Interestingly, Palau March’s courtyard was the location of the last Peccata Minuta tapas event on February 29th. 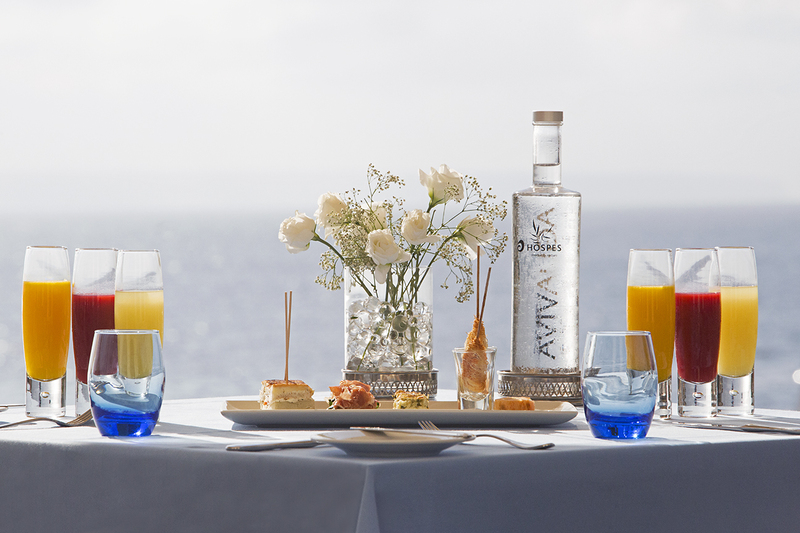 Staying at La Fortaleza isn’t possible for we ordinary mortals, but one of the third episode’s Mallorca locations does open its doors to guests. Playing the role of a hotel restaurant in Monaco, the 5-star Hospes Maricel hotel is a beautiful coastal property which I first visited in 2008, after I was commissioned to write an article about it for a glossy interiors and design magazine. The hotel was used again in the fourth episode screened on March 13th – the one where Jonathan and Jed have a passionate quickie up against a hotel bedroom wall, while Jed’s boyfriend Richard Roper is sitting at night by the pool having a meeting. The hotel is part of the Hospes group, and located in the area of Cas Català, just southwest of Mallorca’s capital Palma. Barcelona-based company ADD+Arquitectura Xavier Claramunt was responsible for this luxurious property’s interior design and the renovation of a late-1940s-built hotel, with stately 16th-and-17th-century influences. The place is gorgeous: ultra-chic, light, spacious, airy, and luxurious, with a long sea-facing terrace. Unfortunately we’ve not yet stayed there, although I had a memorable dinner on the restaurant’s terrace a few years ago. The world’s best breakfast. Photo is the property of Hospes Maricel. Hospes Maricel is probably best known for its award-winning breakfast – named ‘The best breakfast in the world’ by gastronomy critics at the second Madrid Fusion summit. This three-hour gastronomic adventure in the hotel’s Maricel Restaurant offers an innovative and seemingly endless tasting menu of seasonal dishes, and costs 48€ a head. I’d love to tell you all about it but I’ve yet to try the world’s best breakfast. Had I known that Hugh Laurie was visiting, I’d have been there by now. UPDATE: In August 2017, this special breakfast will be relaunched. Having tried it in advance, I can recommend it. You don’t have to stay overnight to breakfast here, but you do need to reserve your place a day in advance (up to 3pm). Even if your name is Richard Roper . . .